If you have ever peeled the skin off of a chicken breast, you have seen fascia. It is the white, web-like structure that holds the skin to the muscle. Fascia is woven throughout our bodies. It begins just under the skin, envelops our muscles, and goes as deep as the bone. Fascia grows to the shape in which we commonly hold our bodies and acts like a form of shrink-wrap to provide extra support. While this helps our muscles from becoming so fatigued, it causes restriction in movement and can keep our bodies from returning to the correct anatomical position which leads to misalignment and pain. Restrictions in the fascial tissue also can be caused by trauma, inflammation, and surgical procedures. These restrictions can create tensile pressures as high as 2,000 pounds per square inch! With such intense pressure, it is no wonder that people who have fascial restrictions have pain. 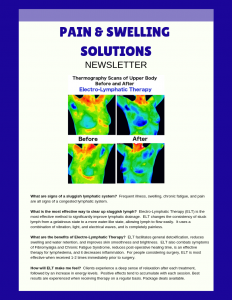 Oftentimes people with fascial pain go to the doctor who sends them for x-rays, CAT scans, myelograms, electromyography, and so forth, but nothing is ever discovered because these methods do not look at fascia. The hands of a well-trained myofascial therapist by contrast can locate these restrictions with extreme precision and can release them gently to eliminate the pain. How Can Myofascial Release Help? Before we can talk about how Myofascial Release can help reduce pain, we need a better understanding of what fascia is and how it functions. We already know that it is woven throughout the body from as superficial as directly below the skin, wrapping each muscle, and going as deep as attaching to the bone. A good way to envision how the fascia envelops each muscle is to think of how the pith of an orange surrounds each segment and holds them together as a whole. 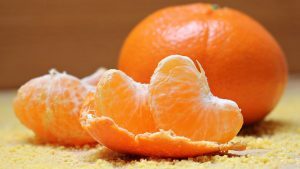 Each section of an orange is surrounded by pith just like each muscle in the body is surrounded by fascia. In addition, fascia has many layers. So, for example, if you looked at the fascia that wraps around a muscle, it would not be a single sheet. 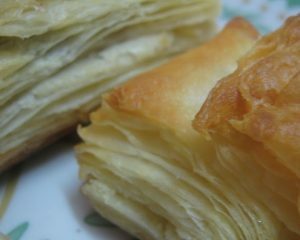 There would be multiple layers of fascia that overlay one another much like phyllo pastry, the stuff used to make the delicious dessert dish Baklava, but they are much, much thinner. Next, let’s examine a single layer of fascia and talk about its structure. Each layer of healthy fascia is like a spiderweb. 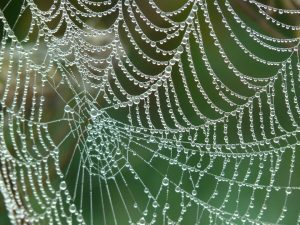 Healthy fascia is like a spider’s web. It is highly organized in a functional structure. 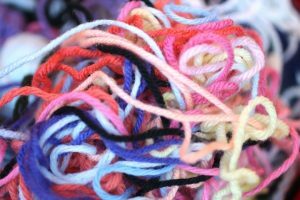 When fascia becomes injured through trauma, surgery, or other form of injury (including overuse/misuse), it becomes chaotic in structure and looks like a ball of yarn that has been played with by a kitten. Unhealthy fascia is a tangled mess. This ineffectual structure can lead to pain. When fascia is no longer structured optimally, the web-like structures tend to become stiff and respond in a less fluid-like manner.